The Museum of Modern and Contemporary Art and Art in Mannheim, Germany, was commissioned at the end of 2017. It is the largest museum building in Germany and a model of architectural art. 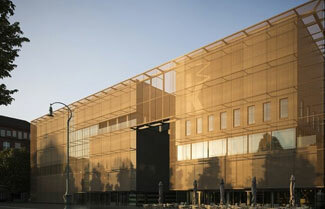 The exterior of the museum is covered with GDK brass stainless steel wire mesh. The atrium is covered with a glass roof, with plenty of light and fascinating scenery in all directions. The spacious space and the sense of world harmony stimulate the curiosity of tourists in exploring space. The stainless steel wire mesh exterior wall further emphasizes this style, defines the overall color tone of the building, and respects the local sandstone texture adopted by the surrounding buildings. The transparency of the wire mesh coated by the architect on the large glass surface is obviously higher than that of the wire mesh coated with the fibre cement board. Regardless of the viewing distance, this varying degree of transparency retains the effect of architectural concepts. Despite the huge size of the building structure and facade, woven silk mesh has texture effect even from a distance. GKD weaves 316 stainless steel wires and tubes of two different diameters (3 mm and 25 mm) into four strands of wound stainless steel strands. The key here is to use braiding technology to balance the different stress ratios caused by different wire mesh thickness, so the facade can withstand the static load requirements caused by wind and snow, and can remain intact under extreme temperatures or hurricanes and other special climatic conditions. The entire metal mesh cover consists of 72 sets of independent brass Stainless Steel Panels, covering a total area of 4635 square meters. Each panel is about 20 metres long and 3.26 metres wide. The different density of brass stainless steel pipes on the wire mesh surface presents different permeability, realizes different line of sight contact with outdoors, and also presents vivid and changeable images under different seasons and sunlight conditions.